Saphenous venous grafts may occlude, with or without symptoms. The intimal hyperplasia that develops after venous grafting could be related to surgical trauma, a loss of intrinsic vascular supply, and exposure of the thin-walled structure to an abrupt increase in wall stress as it is moved from low-pressure venous to the high-pressure arterial environment. This leads to subsequent atherosclerotic degeneration and superimposed thrombus, which will give the clinical scenario of stable angina or acute coronary syndrome. Given the risk of injuring other patent grafts and the generally higher risk of re-operation in an older and sicker patient population, percutaneous treatment of diseased and failing saphenous vein grafts is generally preferred  and accounts for some 10% to 15% of coronary intervention in most centers. A 75-year-old male patient known to have diabetes mellitus, hypertension, dyslipidemia, and coronary artery disease underwent coronary artery bypass graft surgery in 2004 left internal mammary artery to left anterior descending artery, saphenous vein graft to right coronary artery and a jump (Y) graft to obtuse marginal 1 and obtuse marginal 2 presented to the emergency department complaining of chest pain and shortness of breath for three days. He was admitted to the coronary care unit as acute coronary syndrome, non-ST elevation MI and started on ACS medication. ECG showed lateral ST-T wave changes and Troponin I was positive, 1.8 ng/ml. The echocardiogram showed moderate hypokinesis of posterlateral wall and the ejection fraction was 50%. On the second day patient underwent a coronary angiogram, which showed a patent saphenous graft to the right coronary artery; patent left internal mammary artery to left anterior descending artery; and patent Y-graft to obtuse marginal 2 and thrombus in the saphenous graft to obtuse marginal 1 [Figure 1]. Percutaneous intervention was performed using a manual suction technique with a small pediatric microvena snare catheter 4F (ev3, Plymouth, Minnesota. USA). After manual suction few times the graft become clear [Figure 2] and both small organized and fresh clots were removed [Figure 3] and no angioplasty was done in this case. Patient was discharged from the hospital in a very stable condition in a few days. Saphenous vein grafts exhibit different pathologies at different intervals after operation. Between 3% and 12% of saphenous vein grafts occlude within the first month after bypass surgery. At this early stage, the principal underlying mechanism is graft thrombosis, which is caused by a combination of diffuse endothelial disruptions, changes in blood rheology and alterations in flow dynamics. Most saphenous vein grafts examined more than two to three months after operation have developed a proliferative intimal fibroplasia. This is not friable, and is rarely a cause of stenosis or occlusion. SVG degenerative disease can simulate native coronary artery disease in clinical presentation and patients with superimpose clots in their SVG can present with ACS, which include STEMI and non STEMI and U/A. 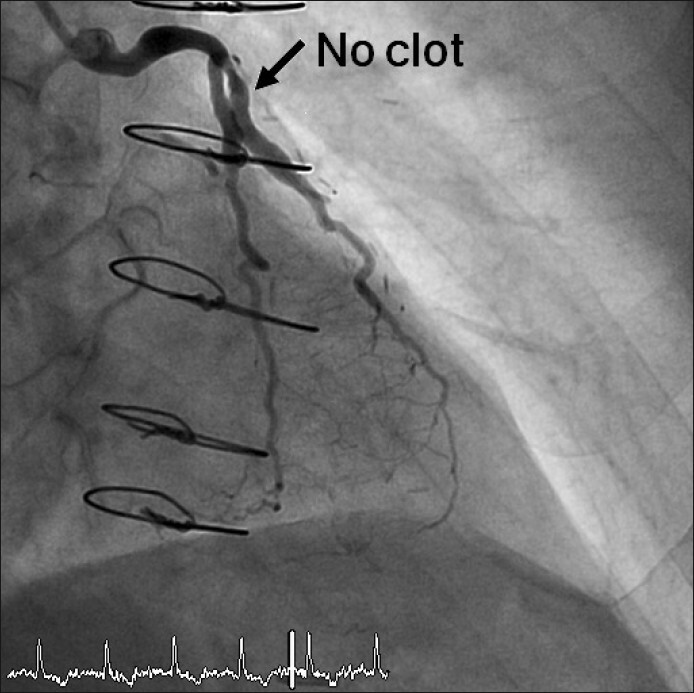 In few cases were clots are big, invasive cardiologists prefer to use all methods together to minimize the distal embolization and decrease the no reflow phenomenon. The cornerstone of ACS is stabilization of patients and lesion using aggressive medical therapy including dual antiplatelets therapy Aspirin and clopidogrel and Glycoprotien IIb/IIIa inhibitors in the first 24 hours of patient presentation. In our case, the patient was treated in the usual manner with anti-ischemic medication in addition to ASA and Plavix; Tirofiban (Aggrastat) was given for 24 hrs prior to angiography. The patient was stabilized medically and his graft angiogram showed a big clot in one of the arms of a Y graft going to OM1 at the proximal segment. We chose to use microvena snare catheter that is mainly used in pediatric cath labs for different purposes. It comes as a snare kit including a snare and a catheter. We used only the catheter because we have used it before in three different adult cases with clots in native coronary arteries and we found that it is one of the least traumatic devices in such cases. Manual suction was applied through this catheter nicely and repeated a few times. The angiographic pictures showed a cleaner SVG after manual thrombus suction. The optimal strategy for treating these SVG lesions remains unclear. PCI is the best treatment option in ST-segment elevation acute MI. However, contrary to the native vessels, PCI of saphenous vein grafts is associated with serious complications such as distal embolization, no reflow, and slow flow. To overcome these problems, there are embolic protection devices available for eligible patients. Saphenous graft thrombosis is a challenging pathology. 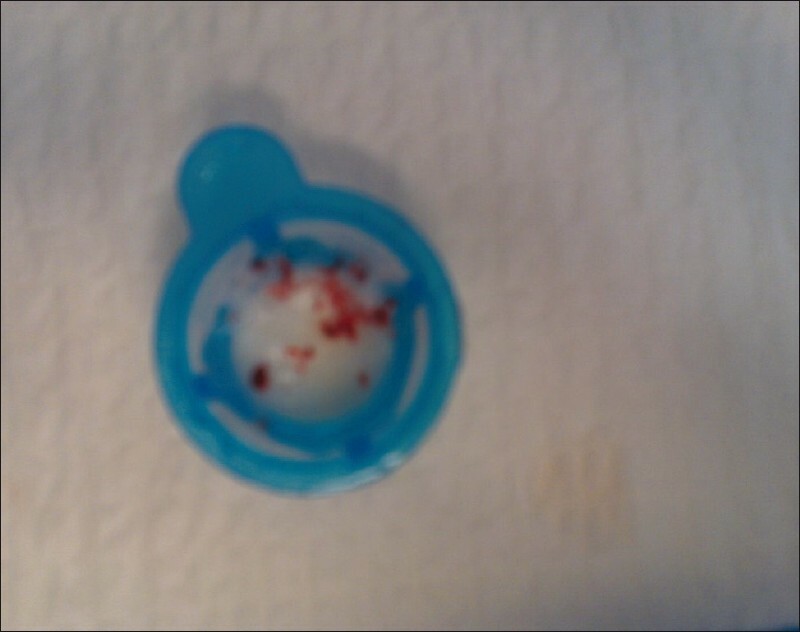 It can be removed by available aspiration catheters using a small less traumatic catheter such as the pediatric microvena snare catheter that we used in this patient. The microvena snare catheter is feasible and safe for aspiration of saphenous vein graft thrombus. 1. Morrison DS, Sethi G, Sacks J, Henderson WG, Grover F, Sedlis S, et al. Percutaneous coronary intervention versus repeat bypass surgery for patients with medically refractory myocardial ischemia: AWESOME randomized trial and registry experience for post-CABG patients. J Am Coll Cardiol 2002;40:1951-4. 2. Hong MK, Mehran R, Dangas G, Mintz GS, Lansky A, Kent KM, et al. Are we making progress with percutaneous vein graft treatment? A comparison of 1990 to 1994 and 1995 to 1998 results. J Am Coll Cardiol 2001;38:150-4. 3. Keeley EC, Velez CA, O'Neill WW, Safian RD. Long-term clinical outcome and predictors of major adverse cardiac events after percutaneous interventions on saphenous vein grafts. J Am Coll Cardiol 2001;38:659-65. 4. 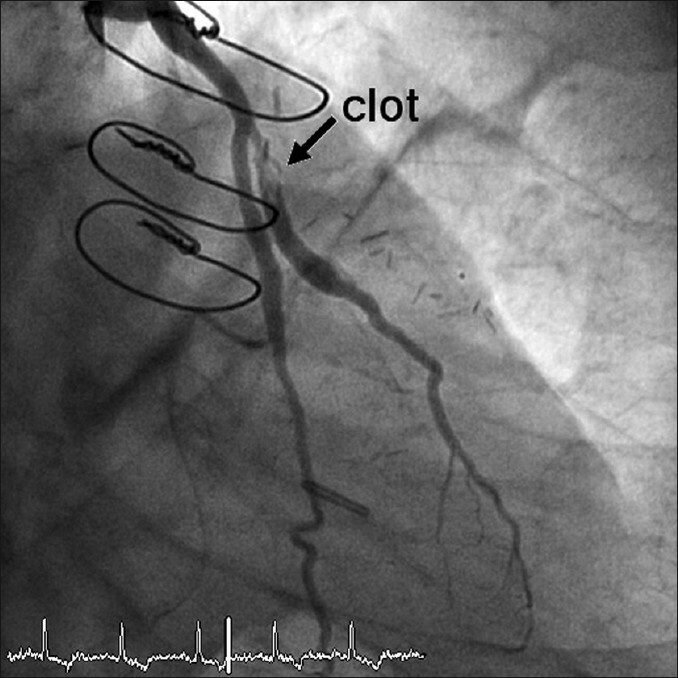 Shah RA, Khanal S, Kugelmass A. Spontaneous late thrombolysis of an occluded saphenous vein graft subsequent to acute myocardial infarction treated with percutaneous coronary intervention to the native culprit vessel. J Interv Cardiol 2006;19:178-82. 5. Nguyen TT, O'Neill WW, Grines CL, Stone GW, Brodie BR, Cox DA, et al. One-year survival in patients with acute myocardial infarction and a saphenous vein graft culprit treated with primary angioplasty. Am J Cardiol 2003;91:1250-4. 6. Al Suwaidi J, Velianou JL, Berger PB, Mathew V, Garratt KN, Reeder GS, et al. Primary percutaneous coronary interventions in patients with acute myocardial infarction and prior coronary artery bypass grafting. Am Heart J 2001;142:452-9. 7. Motwani JG, Topol EJ. Aortocoronary saphenous vein graft disease: Pathogenesis, predisposition, and prevention. Circulation 1998;97:916-31. 8. Cohen R, Domniez T, Foucher R, Sfaxi A, Elhadad S. Intracoronary thrombectomy with the Export Aspiration Catheter before angioplasty in patients with ST-segment elevation myocardial infarction. Ann Cardiol Angeiol (Paris) 2007;56:48-53. 9. Zhao HJ, Yan HB, Wang J, Song L, Li QX, Li SY, et al. Comparison of Diver CE and ZEEK manual aspiration catheters for thrombectomy in ST-segment elevation myocardial infarction. Chin Med J (Engl) 2009;122:648-54. 10. Turco MA, Buchbinder M, Popma JJ, Weissman NJ, Mann T, Doucet S, et al. Pivotal, randomized U.S. study of the Symbiottrade mark covered stent system in patients with saphenous vein graft disease: Eight-month angiographic and clinical results from the Symbiot III trial. Catheter Cardiovasc Interv 2006;68:379-88. 11. Hamilos MI, Kochiadakis GE, Karalis I, Skalidis EI, Igoumenidis NE, Vardas PE. Combined use of aspiration catheter and distal embolisation protection device to facilitate angioplasty of a totally occluded saphenous vein graft. Hellenic J Cardiol 2007;48:117-21. 13. Beran G, Lang I, Schreiber W, Denk S, Stefenelli T, Syeda B, et al. Intracoronary thrombectomy with the X-Sizer catheter system improves epicardial flow and accelerates ST-Segment resolution in patients with acute coronary syndrome. A prospective, randomized, controlled study. Circulation 2002;105:2355-60. 14. Sharafuddin MJ, Hicks ME, Jenson ML, Morris JE, Drasler WJ, Wilson GJ. Rheolytic thrombectomy with the Angiojet-F-105 catheter: Preclinical evalation of safety. J Vasc Interv Radiol 1997;8:939-45.